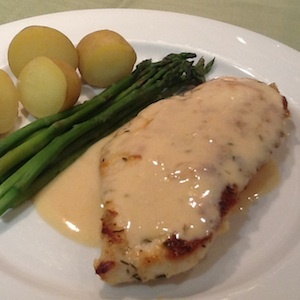 A healthy dish with a sophisticated cream sauce that is quick and easy that tastes much more complicated. It will certainly please everyone. Slice the chicken breasts in half flat side down and lengthwise to create thin cutlets. In a small bowl cornstarch, sour cream, yogurt and mustard.